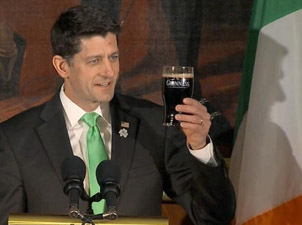 On this St. Patrick’s Day, when Republicans in Congress named Ryan and McCarthy mutter darkly about the corruption of the poor by big government, it is important to remember that for most of their history in America, most men and women with such names, Irish Catholics, embraced government and what it could do for them and others. It was not because Irish American Catholics were unwilling to work hard, they were; or to live frugally, and put money in the bank, they did. Yet as a people so poor, with no useful skills or capital, and confronting discrimination in the private marketplace (“No Irish need Apply”) work and frugality alone were often not enough for them to survive, much less prosper in America. Private philanthropies, run by hostile elites, offered them little help: only “charity scrimped and iced,” as John Boyle O’Reilly, the editor of the Boston Pilot, wrote, “in the name of a cautious, statistical Christ.” Empowered by their voting numbers, many Irish American Catholics thus looked to government for jobs, and pushed politicians to provide the small services they needed to tide them over crises: coal in the winter; a place to live after a fire. By the 1890s, however, as the second major depression in twenty years rocked the American economy, immigration escalated into the tens of millions, and festering slums spread throughout cities, politicians’ petty handouts and charities’ cautious penny pinching was no longer enough. Reformers, bearing the new name “Progressives,” began to insist that the government address the problems of workers and the poor. These Progressives are often described as enlightened middle or upper class, WASP women and men awakening to the crises of the city. Many of them were, but Irish American Catholic people and politicians became involved in this struggle too. Newly powerful Irish American Catholic representatives in the New York New Jersey, Massachusetts, and Illinois legislatures fought for causes such as: a minimum wage, worker’s compensation, factory safety, and public housing. In Oregon, Irish American Catholic settlement worker, Caroline Gleason, teamed with Fr. Vincent O’Hara to pass a minimum wage and maximum hours law for working women, the first in the country. Meanwhile Irish Catholic women like Mary Shinnick and Elizabeth Moloney were in the forefront of fights for “mothers’ pensions” in Illinois and Massachusetts. This tradition would not end in the 1930s, but has endured among many to our own time. It has drawn inspiration from Catholic Social Justice, from people like Monsignor John A. Ryan, for example, called “the Father of the Minimum Wage,” and from common good and anti-aristocratic themes in American and Irish republicanism. For the most part, however, Irish American Catholics eschewed theories of left or right. They were looking for practical solutions to concrete needs. They had no fear that government help would somehow sap their commitment to work or self-improvement, but they could remember when a government’s failure had left a million of their relatives dead on the hillsides of a Famine-stricken Ireland. They saw no reason, then, why a democratic government like the United States, should not help its people when they were in need. This entry was posted in Budget, Front Page, Spirit Filled Network on March 16, 2018 by networklobby.